The Eldon House is a lovely little pub tucked away on Lower Clifton Hill far from the hustle and bustle of nightlife on Queen’s Road and Park Street. I often walk past it on my way home and there is always a cosy knot of people chatting at the bar, and one or two sipping a pint of ale on the wooden benches outside, causing me some amount of lifestyle envy I must say. Tuesday night it was our turn to be amongst the cosy knot perusing the good choice of ales (Bath Gem for me) and lagers (Amstell for him) and deciding whether to take advantage of “Tuesday Night is stew night”; a bowl of stew and a pint for the princely sum of £6.50, or pick something from the board of dishes on offer. I chose wild mushroom and goat’s cheese risotto, with petit salad and garlic toast, and he the 8 oz ribeye steak, with roast flat mushroom, tomatoes, chips and pepper sauce. We took our drinks and found a seat on the raised stage (used for live music on various days of the week but today occupied by diners). I fully approved of the background music being played unobtrusively which was a trip down memory lane and a nice bit of Motown. 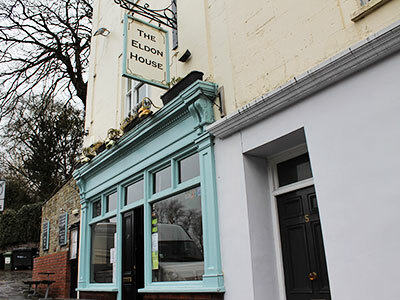 The Eldon House is a proper community spirited pub and almost every night they run something to appeal to not just drinkers and eaters but to those who want a bit of a night out at the same time; quizzes, karaoke and the like, as well as the live music. Our meals arrived and we took the chance to ask our charming and friendly waitress to recommend us a good glass or red wine to go with them, and her tip was a fine and fruity Malbec that indeed hit the spot perfectly. The steak looked magnificent, draped over a large pile of chips, topped by a beautiful buttered flat mushroom and a small jug of pepper sauce at the side. My risotto, steaming gently in the bowl, was topped by a small fresh salad, and toasted slices of crunchy garlic bread. Both were delicious, the steak very tender (especially bearing in mind the cut) and cooked perfectly and I really enjoyed the risotto to the last grain of rice. Oh, and I confess to stealing a few chips dunked in the creamy pepper sauce! We had a lovely evening in the most convivial of surroundings with good food, reasonably priced. Our waitress, who doubled up as barmaid too, told us that they do awesome Sunday lunches where you have to fight to get a table so we decided to do just that sometime!